As Congress president Rahul Gandhi addressed start-up entrepreneurs at an event in Bengaluru on Monday, a large number of people raised slogans in support of Prime Minister Narendra Modi outside the venue. 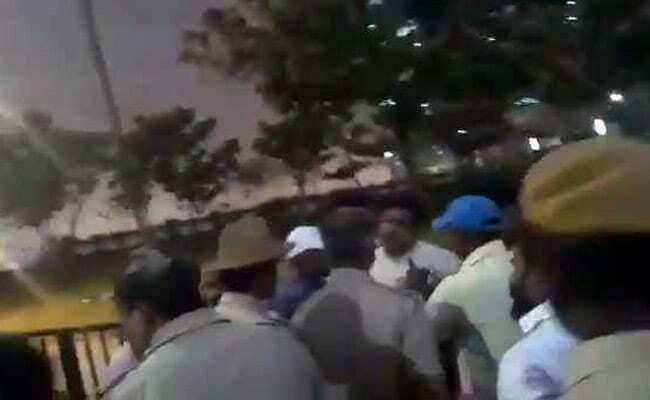 In videos, policemen are seen chasing away protesters shouting "Modi, Modi" loudly outside the Manyata Tech Park, where Rahul Gandhi was delivering his address. "Hugs for 'Tukde Tukde' gang and arrest of peaceful youth raising pro-Modi slogans? Where are the champions of 'Free Speech'? Yuvraj of Congress must know 'An era moves in the direction in which the youths move'. Stop intimidating youth of India, which has rejected your brand of politics," BJP president Amit Shah tweeted. State BJP leader CT Ravi alleged that Congress workers had "attacked techies who shouted Modi-Modi slogans". The Bengaluru police denied any arrests. "No one has been arrested, only people were dispersed without use of force," said senior police officer Seemanth Kumar Singh in tweets. The officer said one section of the crowd was "too close to the SPG protectee (Rahul Gandhi)."